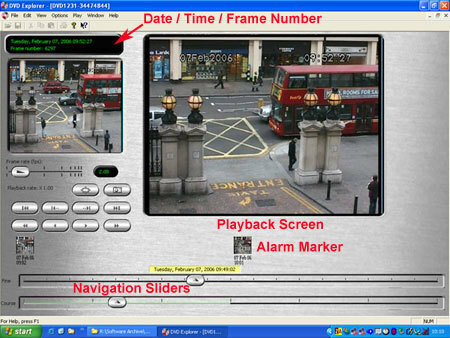 The AfterBurner DVD-Explorer software player has been designed to quickly review and navigate video-DVDs produced by the AfterBurner time-lapse DVD recorder. 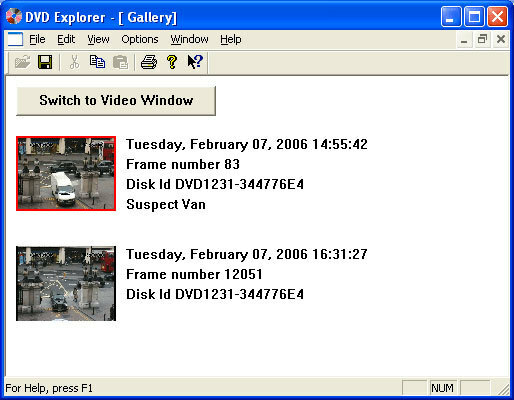 Once a video file or DVD has been successfully opened, the DVD-Explorer Main Screen is shown. This consists of a review screen that shows the video, along with a number of navigation buttons and sliders. The second smaller screen shows the last captured still image or chapter / alarm thumbnail. Coarse and fine sliders allow for quick navigation throughout the DVD. To move around the DVD, click and drag either slider button. As you do so, the corresponding date and time is shown. The DVD Explorer Gallery is designed to give a summary of the points of interest on a DVD. Clicking the capture button on the Main Screen transfers a still image of the current play position to the Gallery. Clicking any of the thumbnail images in the Gallery causes the Main Screen to be opened at the point of that event. The captured images may also be saved as JPEG or BMP file. Picture Gallery - frames can be bookmarked and saved, with user comments to a picture gallery for later review. Jog and shuttle - can be interfaced to an external jog and shuttle pad for effective control of playback functions.